More Power! 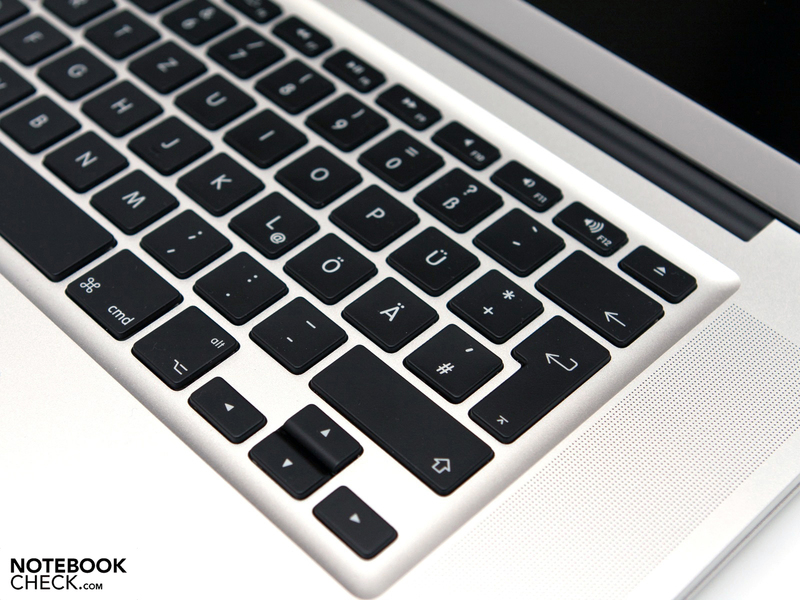 As the final version of the Apple MacBook Pro 15, we've chosen to test out the most powerful hardware configuration. The Intel i7-2720QM CPU coupled with the AMD Radeon HD 6750M should ensure outstanding performance. 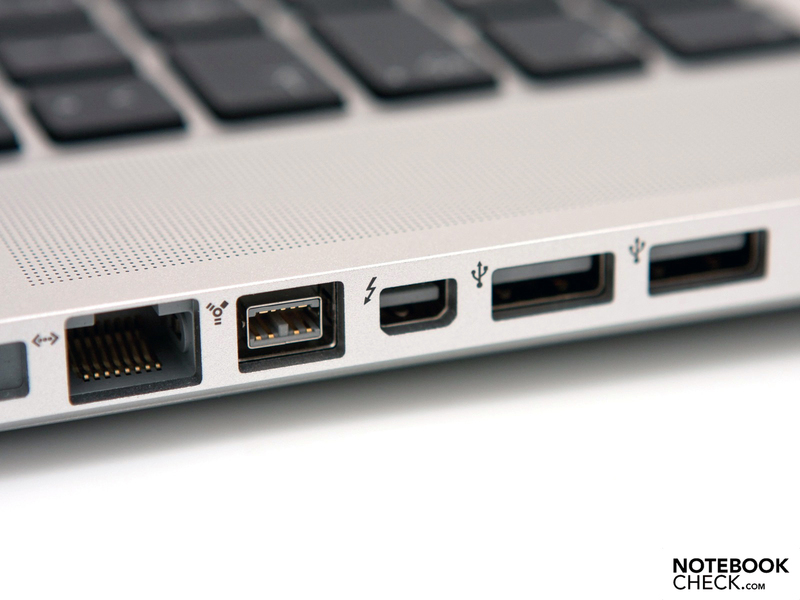 But, what are these powerful components housed within a sleek aluminum case truly capable of? After it became apparent that there was some undesirable downsampling of the CPU in Apple MacBook Pro notebooks at times when the highest level of performance was needed, we decided to take a closer look at the various configurations of the new generation of MacBook Pros. To supplement the review of the starter model with an Intel 2635QM CPU and an AMD HD 6490M graphics card, we now dive into a thorough inspection of an otherwise identical model, however this time with a more powerful hardware configuration consisting of an Intel i7-2720QM Sandy Bridge CPU and an AMD Radeon HD 6750M graphics card. At a price of 2,149 Euro, this version costs a handsome 400 Euro more than the entry-level model we've already reviewed. Given an upgrade to a higher-resolution WSXGA+ display, the price climbs another 100 Euro for the glossy-screened version and 150 Euro for the matte display (review here). If money isn't too much of an issue, upgrading the CPU to a 2820QM (+100 Euro), the memory (8GB for +200 Euro) or—if you're really feeling adventurous—the hard drive (512MB SSD +1,100 Euro) is fully within your range of options. 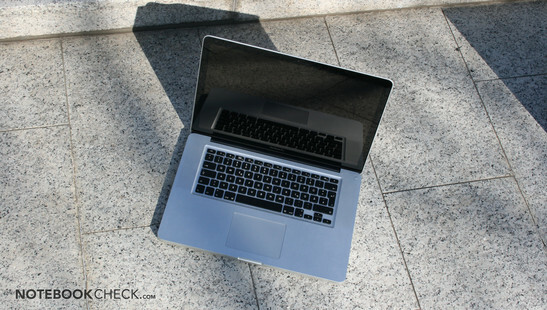 For a discussion of the sections "Case", "Connectivity", and "Input Devices", please refer to our review of the identically built MacBook Pro 15 Early 2011 with a 2635QM CPU and an AMD HD 6490M graphics card. The following review is dedicated first and foremost to the laptop's performance, system noise/heat as well as battery life—that is, an analysis of what effect the more powerful hardware in place here will have. We first take a quick look at the display. At a resolution of 1440x900 pixels (16:10), the display that comes standard here gives you a bit more work space on the screen than the typical HD format (1366x768). Still, the MacBook Pro doesn't stand too proud compared to sharper full-HD displays. Apple does offer the option of upgrading to a high-quality WSXGA+ display (1680x1050), but for the extra cost it still doesn't reach the pixel count of true full HD, which might come as a disappointment particularly to film buffs and professional photo/video editors. Nevertheless, the standard display here shines with a good average screen brightness of 227 cd/m² and an appealing contrast ratio of 619:1. Once again, Apple shoots for the sRGB color space, which it covers fairly well. Upgrading to the higher-resolution screen has no benefit as far as the color space goes. 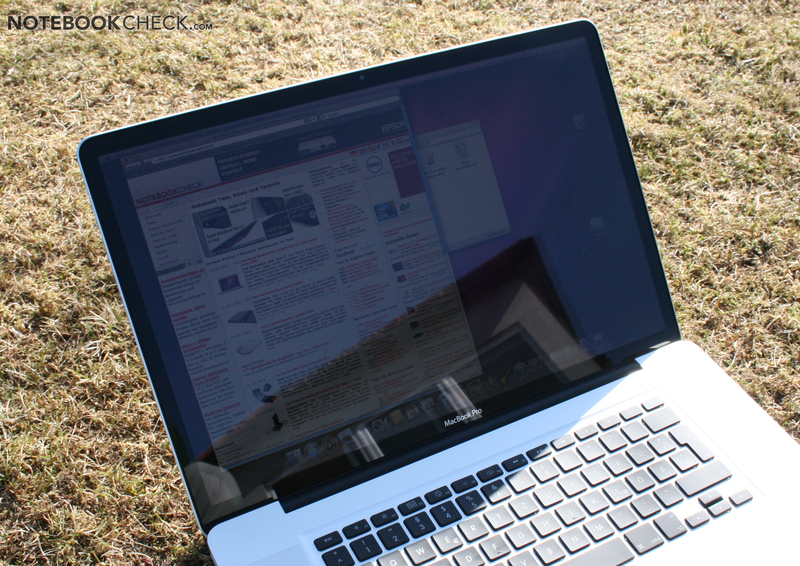 You can find details about the glossy WXGA+ display in this review. 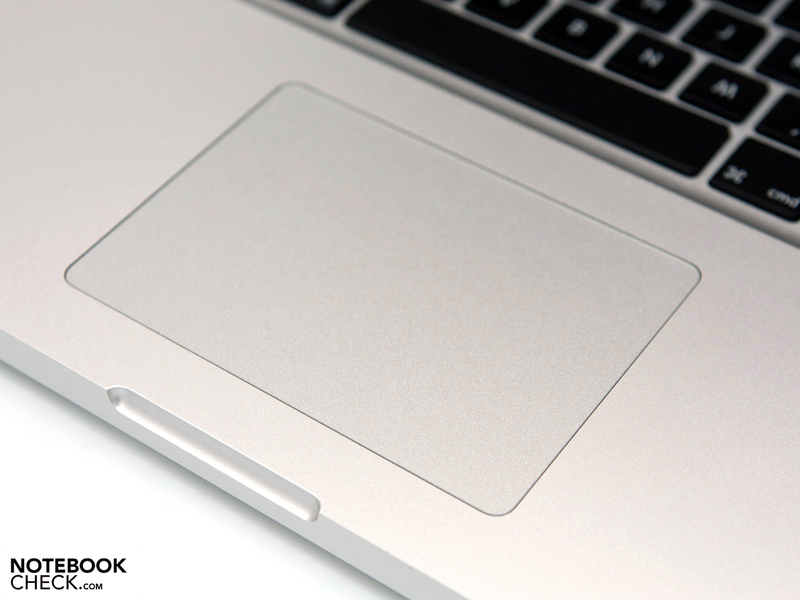 For info about the the MacBook Pro 15 Early 2011 with a higher-resolution matte WSXGA+ display, check out this comprehensive review. 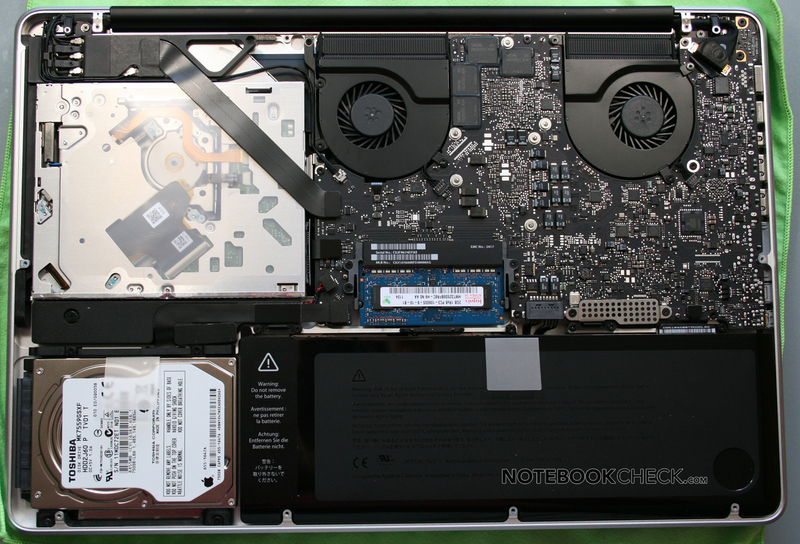 The 2.2 GHz MacBook Pro 15 (MC723LL/A) has inherited the inner workings of the large MacBook Pro 17. The more powerful Radeon HD 6750M in place here really stands out compared to the small entry-level 6490M graphics card found in the 2 GHz MacBook Pro (MC721LL/A). There's a great deal of characteristics that separate the model in review here from the standard model: 480 shaders instead of 160, a 128-bit memory bus instead of 64-bit one and 1GB of GDDR5 RAM as opposed to the 256MB of the starter model. On top of that, the Core i7-2720QM in place here runs at a 10% higher base clock rate and 14% higher maximum turbo clock rate. Even the on-board graphics card in this laptop can reach a slightly higher turbo clock rate of 1.3 GHz than the one mounted on the 2 GHz i7-2635M CPU of the standard model. Finally, the CPU in place here has two more Sandy-Bridge-core features not available in the standard model: VT-d virtualization and AES functions. Since Mac OS X does not currently support AES, this becomes a moot point. 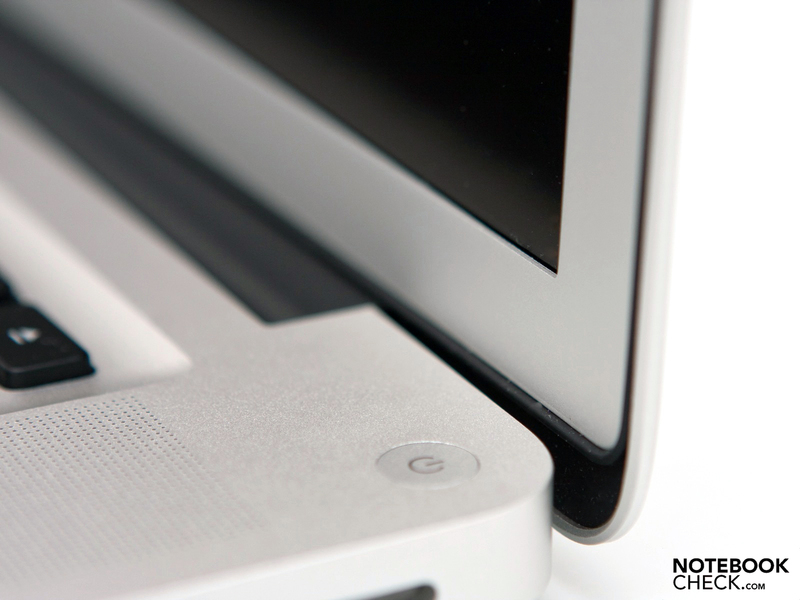 The final distinguishing factor between the two MBP15 versions is the hard drive: In the case of the 2.2 GHz model at hand here, a larger 750 GB HDD takes care of all your storage needs. In our Windows benchmarks (Windows run via BootCamp), the Core i7-2720QM got to flex its muscles and impress us quite a bit. Compared to the entry-level 15" MacBook Pro with a 2635QM quad-core CPU, our laptop here runs 4-16% faster in processor-focused benchmarks. 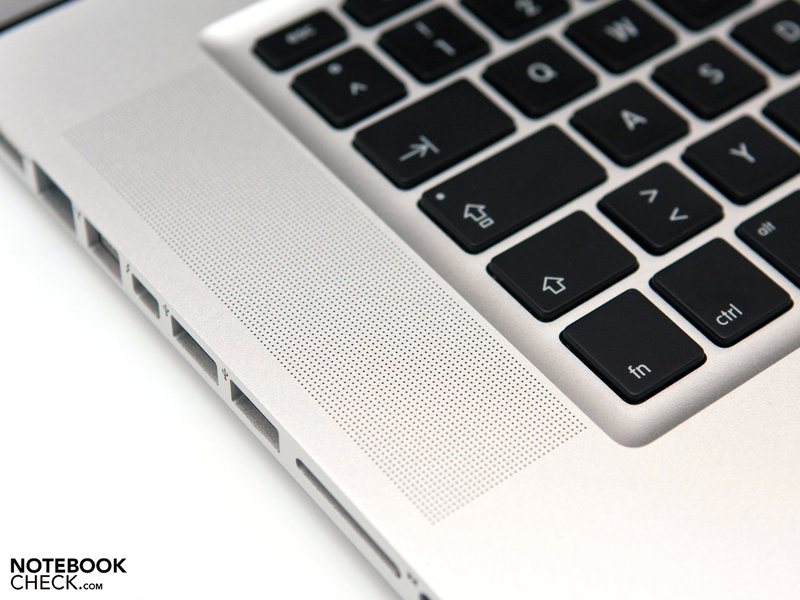 Compared to other Windows notebooks, the sleek aluminum MacBook Pro manages to rank in among the best of them. Only in the 3DMark06 CPU test did our model end up in the lower half of notebooks equipped with a 2720QM (but above 2630QM-based notebooks). Compared to the MacBook Pro 17 with practically identical hardware, the results are virtually the same. The difference between these processors is considerable, but the Radeon HD 6750M graphics card here gains an even bigger lead over the 6490M in the standard MBP15. According to the overall score achieved in the 3DMark benchmark, the standard model runs about half as fast. Even when playing demanding modern games like Call of Duty: Black Ops or Battlefield: Bad Company 2, the 6490M is still about half as fast as its speedier cousin. Even the GeForce GT 330M of the previous generation puts the AMD graphics card of the entry-level 15" MBP to shame. The difference in performance of these two GPUs came to 30%-50% in our benchmarks. 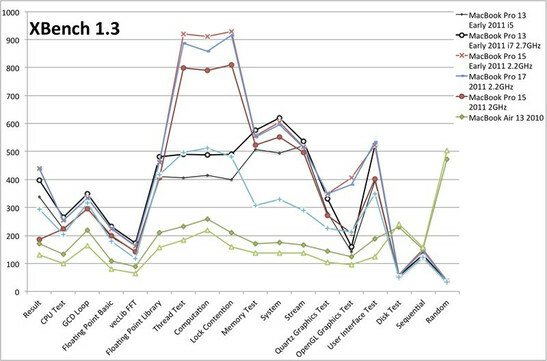 Using PCMark Vantage, we measured overall system performance in Windows. The laptop in review here surprisingly managed to even trump the MacBook Pro 17 by 8%. The 15" entry-level model earned only about 76% as many points in this benchmark. Compared to Windows notebooks, the 2.2 GHz MBP15 is on par with the Asus N53SV, having the same CPU and a GeForce GT 540M graphics card. The Eurocom Racer equipped with the same CPU as well as GPU jumps 20% ahead thanks to its hybrid HDD. The new quad-core MacBook Pro notebooks pull of a better performance in some areas according to the XBench benchmark than the dual core MBP13 notebooks and CPUs of the previous generation (MacBook Pro 17 2010). In the memory, system and stream subtests, the new Sandy Bridge CPUs performed brilliantly in general, a great deal better than the older Core 2 Duo processors. The overall score in XBench seemed to erratically change depending on the trial, giving very unreliable results, (sometimes a trial gave an overall score twice as high as the one measured several seconds earlier and with very similar sub-scores at that). Analyzing these results further would therefore make little sense. Like in the previously reviewed MacBook Pro 17, we once again have a Toshiba hard drive here (model number MK7559GSXF) with a storage capacity of 750GB, spinning at 5400 RPM. The HDD score achieved in the HD Tune benchmark was very good, albeit a slightly lower score than the hard drive in the 17" MBP managed to get. 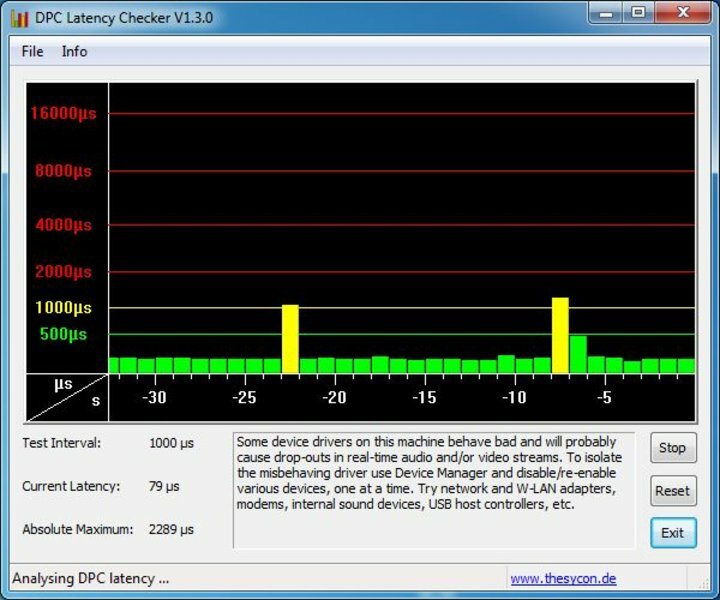 The DPC latency values (measured in Windows) of MacBook Pro laptops of the new generation that have an AMD graphics card are all similar, remaining below the critical red area (DPC Latency Checker Tool). 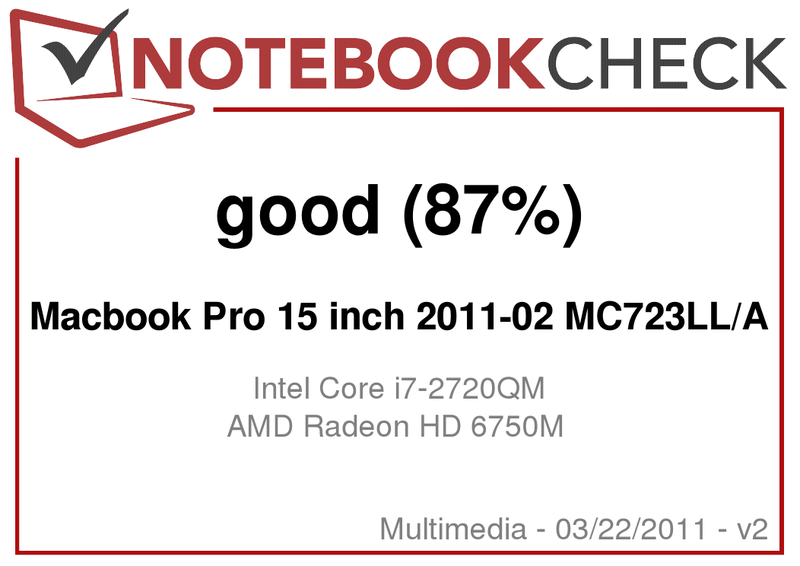 The results of the 17" MBP are actually a perfect 1:1 match with those of the 2.2 GHz 15" MBP in review here. Thanks to its speedy GDDR5 memory, the HD 6750M ranks in above average among mobile graphics cards and allows for a smooth-flowing picture in current Windows games. 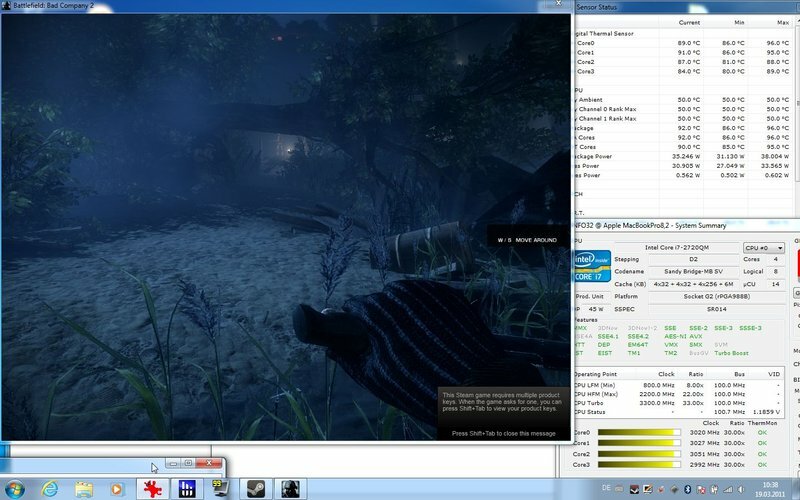 For a breakdown of all Windows games tested on the Radeon HD 6750M, check out its GPU breakdown page. The nearly silent cooling system under light use is something that both versions of the new MacBook Pro 15 have in common. 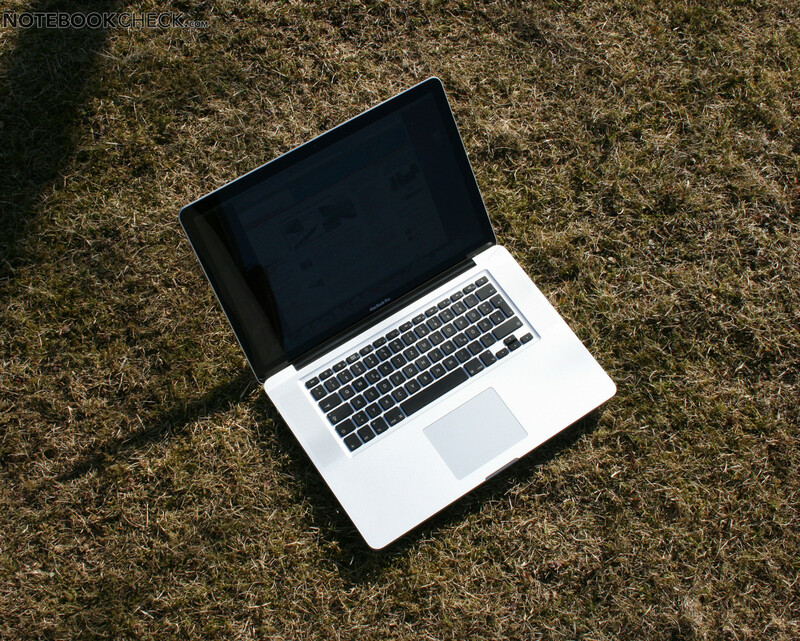 In Windows 7 as well as Mac OS X, only the gentle hum of the hard drive can be heard. In order to hear the fans at all, you have to place your ear within centimeters of the cooling vents as the two fans spin at a minimum of 2000 RPM (28.8 dB(A), 1.22 Sones). When doing simple office work like browsing the internet, both fans rotate at a constant 2000 rpm. Running xBench or the OpenGL test from Cinebench in MacOS shows the laptop remains more than sufficiently cool when idle: both fans remain at a constant 2000 RPM despite some hardware stress. In the stress test in Windows 7 (Furmark+Prime95) we measured a maximum noise level of 46.1 dB(A), that is, 4.75 sones (6200 RPM). This result here is the same as that for the standard model of the MacBook Pro 15. 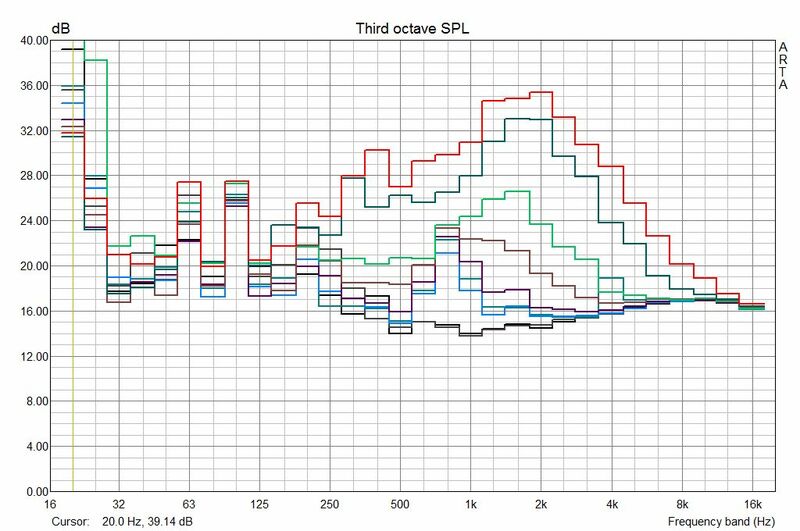 The subjective noise level can be described quite well using the sone scale: the MacBook Pro 15 is just about 4 times as loud during the stress test as when it's idle (1.22 sones vs. 4.75 sones). Subjecting the MacBook Pro 15 to a low level of stress in MacOS, in this case the StarCraft 2 main menu, the laptop remains quiet for a remarkably long time. Only once the CPU temperature reaches 86°C do the fans spring to action and shoot up to 4000 RPM for a short while (34.4 dB/1.9 sones), soon dropping back down to 2000 RPM. After prolonged CPU and GPU stress, like when gaming, the noise level fluctuates between 34.4 dB (1.9 sones) and 40.5 dB (3.1 sones). 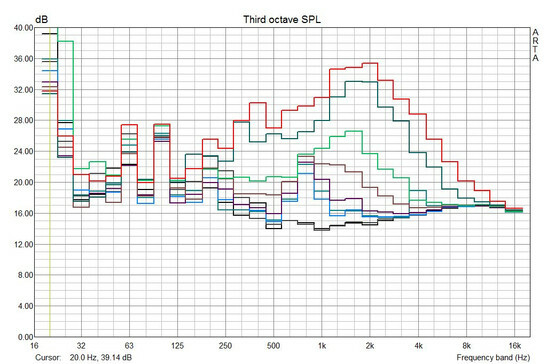 Graph of Noise produced by the Fans in the MacBook Pro 15 at varying rotational speeds (up to 6200rpm). 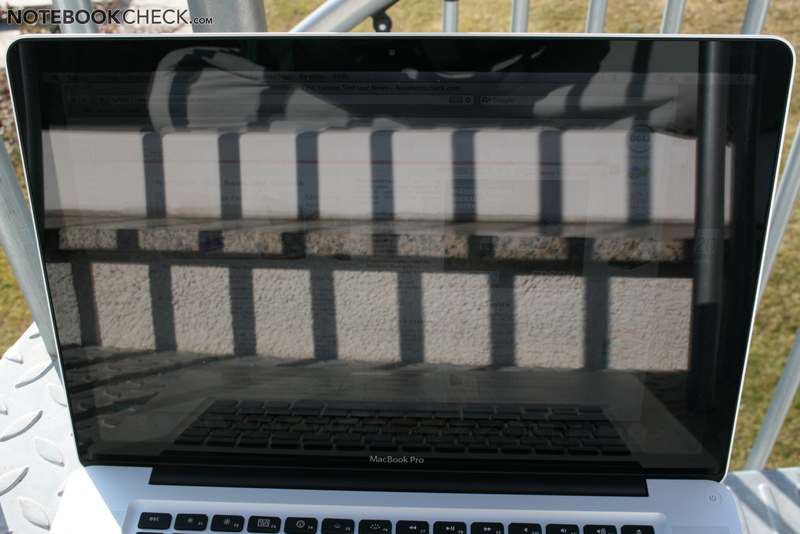 While the entry-level MBP 15" shows a case temperature below 24ºC while idle, the temperature we observed in the more powerful model at hand was a good deal higher. Under light use, the case heated up to 31 °C, which isn't bad at all, feeling only slightly warm to the touch. The temperatures we observed under light use before and directly after the several-hour-long stress test (100% CPU+GPU load) in Windows were nearly identical. 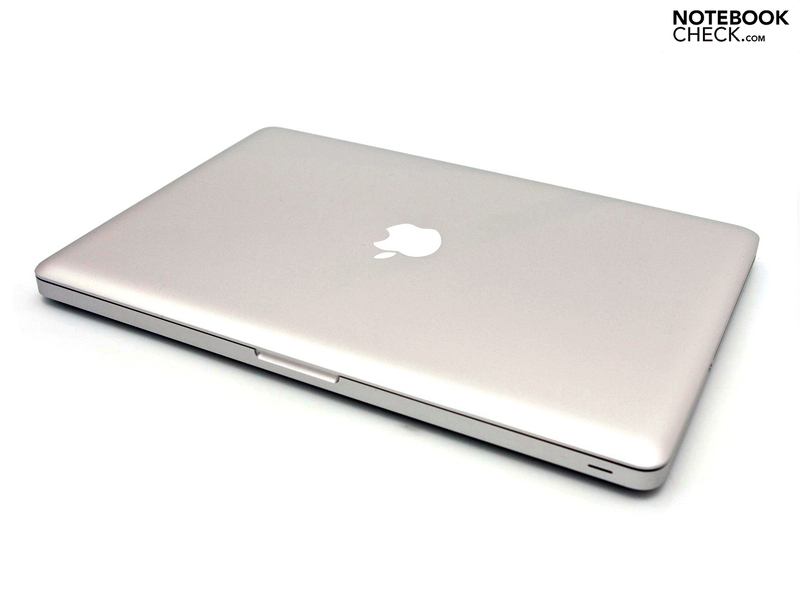 The case surface reaches a maximum of 41°C, nearly the same as the MacBook Pro 15 model with weaker hardware. Only the average temperature is higher for the more powerful model. 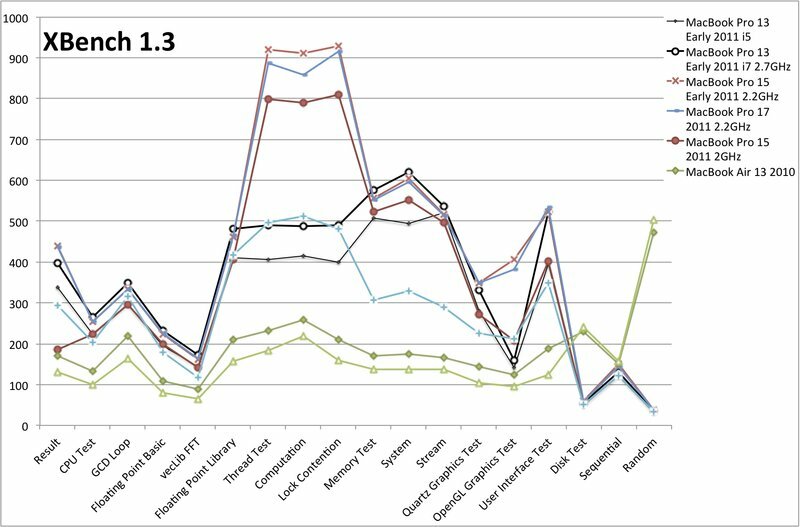 In MacOS, a few isolated measurements indicated a slightly higher case temperature than during the above-mentioned stress test in Windows (Bootcamp). The reason for this is the fan controller that's finely tuned for the lowest possible noise level, the fans sometimes kicking in or shooting up to higher speeds only after a longer while than in Windows. This means, you should expect temporarily higher case temperatures in MacOS than in Windows. The palm rest, however, always remains remarkably cool. Nevertheless, keeping the notebook on your lap (especially in the summer) might prove itself to be a bit uncomfortable under pronounced heavy use. (+) The average temperature for the upper side under maximal load is 31.1 °C / 88 F, compared to the average of 30.9 °C / 88 F for the devices in the class Multimedia. (±) The maximum temperature on the upper side is 40 °C / 104 F, compared to the average of 36.5 °C / 98 F, ranging from 21.1 to 71 °C for the class Multimedia. The temperature inside remains well within the normal limits under light use with fans spinning slowly. 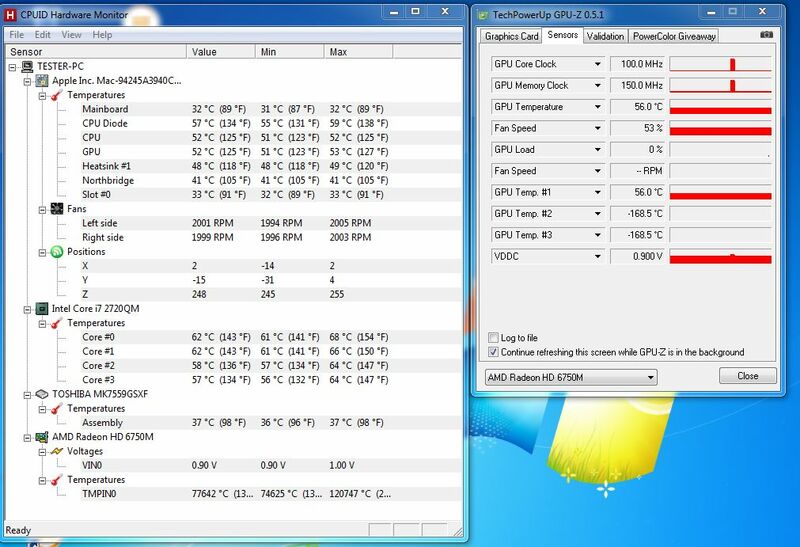 The temperature sensors of the CPU and graphics card indicate 50 - 60°C. The motherboard, northbridge and hard drive remain a good deal cooler. Under extreme stress in Windows, we observed some downsampling of the CPU. This was, however, only the case during the stress test with Furmark and Prime95 running simultaneously, which subjects the system to a very high level of stress that can hardly ever be replicated during real-world use. Even when playing the extremely resource-demanding Battlefield Bad Company 2, we did not experience any CPU throttling. 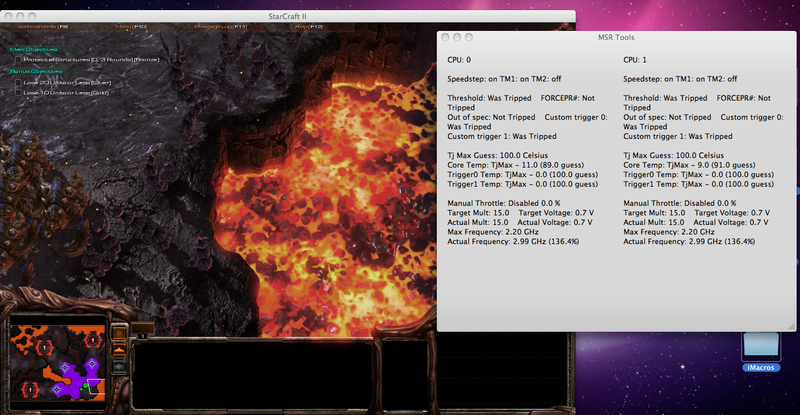 The Turbo Boost functioned flawlessly according to HWInfo32, the CPU temperature, however, reached a very high 90°C. In Mac OS X as well, the Turbo Boost worked according to the MSR tool and since the Update to Mac OS X 10.6.7, the system no longer freezes up when confronted with very high stress on the CPU and GPU. The battery life—measured under various conditions—comes to just a bit under that of the 2-GHz version of the MacBook Pro 15. The only exception is the BatteryEater Classic Test (min. 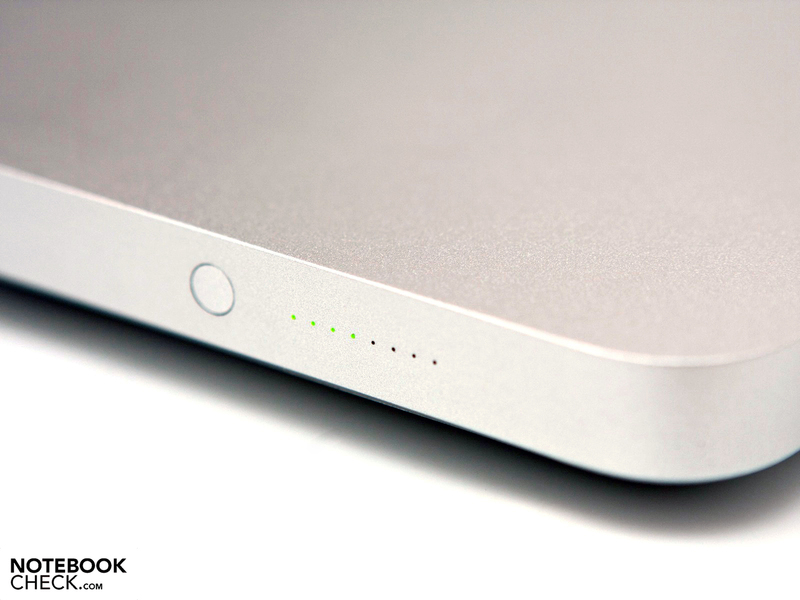 battery life), in which the battery held out significantly longer during the second trial, yielding a longer battery life than the weaker MBP 15". During the first trial, the laptop ran on battery power for 46 minutes—on par with the 2GHz version (53 minutes). 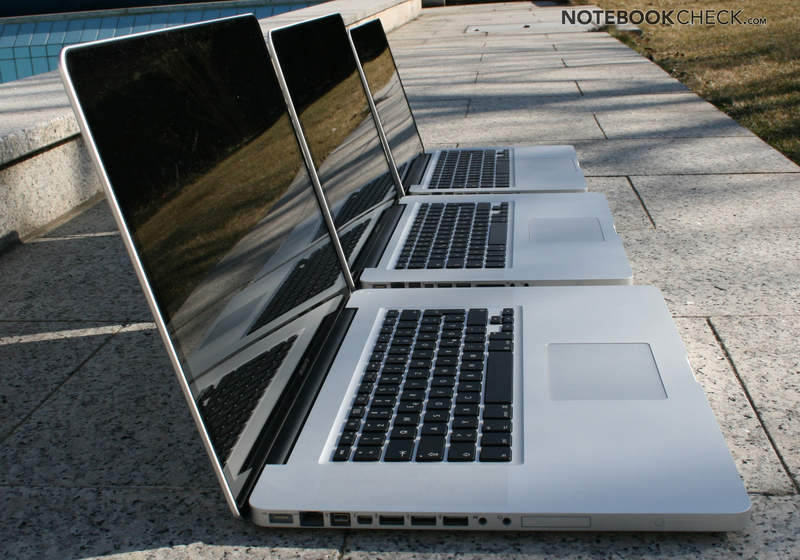 The more powerful version of the 15" MacBook Pro brings quite a bit to the table. Besides the speedier CPU, most notable is the considerably faster graphics card. The GPU here can run current games with high graphics settings and thanks to its 1GB of graphics memory it's better suited for using multiple monitors at once. The larger hard drive is the third and final difference in hardware between the 2.2 GHz MBP 15 and the standard model. You, of course, have to pay for this higher level of performance with a shorter battery life and a bit more noise and heat. The biggest downside of the more powerful version is the excessively high increase in price. For the better hardware configuration, Apple is currently charging 400 Euro on top of the already very high starting price of 1,749 Euro. Mac users with high demands regarding performance, nevertheless, have no other way to go here except for the MacBook Pro 17 with the same hardware but costing 300 Euro more than the 2.2 GHz MacBook Pro 15.